I never fully understood the complex world of rescue until I adopted Otis from Shaggy Dog Rescue. We went four years after losing our dog before I started poking around Petfinder in search of a new companion. There were so many sweet little faces that spoke to me, but ultimately, I reached out to a small rescue about “Mervyn”, a wire terrier schnauzer mix that I thought was located in Danbury. Low and behold, I learned that the dog in question was actually in Houston, TX and discovered more about the beautiful relationship that Shaggy Dog Rescue maintains with Rescue Road Trips. With their combined efforts, these dogs are regularly transported to their forever homes in the northeast. Within a few weeks of going through the application process – we were approved and it was set. On May 18, 2013: MERVYN would arrive and officially become our Otis. In the week leading up to his arrival, I was glued to Facebook. The anticipation builds with every photo along the way, from the pups loading up on Houston, then during potty walks with the Angels in Birmingham & Allentown (when let’s face it, you totally scour the background of EVERY image to see if you can get an extra glimpse of your new baby!) 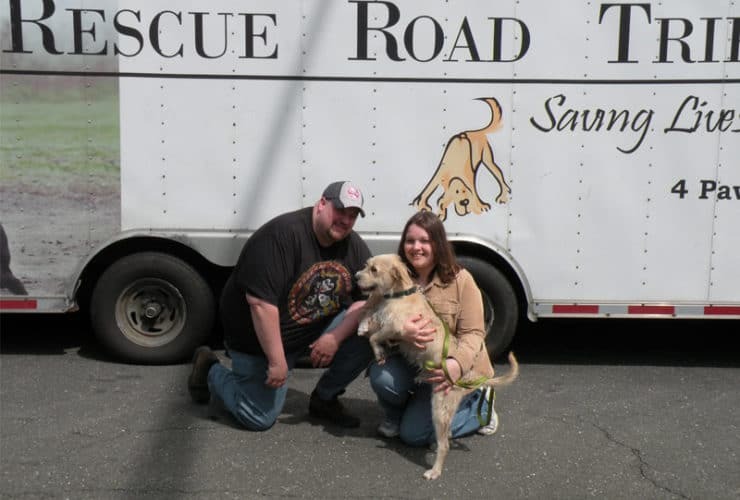 – the Rescue Road Trips crew has masterfully managed to make you want to crawl out of your skin with excitement as your new family member makes the journey halfway across the country – all leading up to the main event – GOTCHA DAY. That Saturday morning, I still remember so many of the emotions: Excited, happy, nervous, anxious and downright giddy. As an adult, Gotcha Day is equivalent to being a kid on Christmas morning. #ABestDayEver As we drove from NY to CT – I was practically dancing out the passenger seat!! We arrived ahead of schedule and got to speak with several other families all feeling the same excitement. In the distance, we watched as the Rescue Road Trips rig made its way off the highway — the very same trailer that we had spent days trailing online was finally appearing right before our very eyes. The culmination of so many weeks of waiting…it was suddenly so very real. The crowd cheered as Greg slowly made his way into the park and ride lot. We stood towards the back and waited our turn – watching several other adopters have their moment before it was finally our turn to meet Otis. My husband readied the camera, and I got the honor of greeting our boy as he came off the truck. And love at first sight it was! When Greg requested a photo afterwards, I squatted down and Otis suddenly put his paws up on each of my shoulders and leaned in for a “hug”. My heart simultaneously overflowed and burst into a million pieces as the rest of the spectators let out a resounding “awwww!” Yep. He knew it. We knew it. He was HOME. Every day since, this sweet shaggy boy puts a smile on our faces and brings so much fun, laughter and silliness into our home that wouldn’t be the same if it weren’t for Kathy at Shaggy Dog Rescue, Greg & Adella of Rescue Road Trips and the countless volunteers, foster families, angels and supporters of rescue work who made it all possible.